Éric Alfred Leslie Satie (French: [eʁik sati]; 17 May 1866 – 1 July 1925), who signed his name Erik Satie after 1884, was a French composer and pianist. Satie was an influential artist in the late 19th- and early 20th-century Parisian avant-garde. His work was a precursor to later artistic movements such as minimalism, repetitive music, and the Theatre of the Absurd. 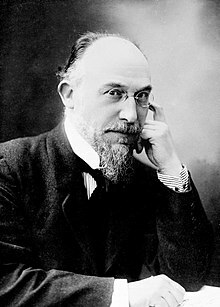 Erik Satie was born on 17 May 1866, the son of Alfred Satie and his wife Jane Leslie (née Anton), who was born in London to Scottish parents. 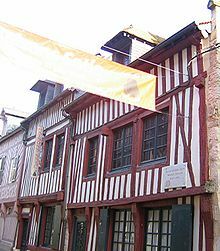 Erik was born at Honfleur in Normandy; his childhood home there is open to the public. When Satie was four years old, his family moved to Paris, his father having been offered a translator's job in the capital. After his mother's death in 1872, he was sent (at age 6), together with his younger brother, Conrad, back to Honfleur to live with his paternal grandparents. There he received his first music lessons from a local organist. In 1878, when he was 12 years old, his grandmother died, and the two brothers were reunited in Paris with their father, who remarried (to a piano teacher) shortly afterwards. From the early 1880s onwards, Satie started publishing salon compositions by his step-mother and himself, among others. In 1879, Satie entered the Paris Conservatoire, where he was soon labelled untalented by his teachers. Georges Mathias, his professor of piano at the Conservatoire, described his pupil's piano technique in flatly negative terms, "insignificant and laborious" and "worthless". Émile Decombes called him "the laziest student in the Conservatoire". Years later, Satie related that Mathias, with great insistence, had told him that his real talent lay in composing. After being sent home for two and a half years, he was readmitted to the Conservatoire at the end of 1885 (age 19), but was unable to make a much more favourable impression on his teachers than he had before, and, as a result, resolved to take up military service a year later. However, Satie's military career did not last very long; within a few months he was discharged after deliberately infecting himself with bronchitis. Satie moved from his father's residence to lodgings in Montmartre in 1887, when he became 21. By this time he had started what was to be an enduring friendship with the romantic poet Patrice Contamine, and had his first compositions published by his father. He soon integrated with the artistic clientele of the Le Chat Noir Café-cabaret, and started publishing his Gymnopédies. Publication of compositions in the same vein (Ogives, Gnossiennes, etc.) followed. In the same period he befriended Claude Debussy. He moved to a smaller room, still in Montmartre (rue Cortot Nº 6, now a museum), in 1890. By 1891 he was the official composer and chapel-master of the Rosicrucian Order "Ordre de la Rose-Croix Catholique, du Temple et du Graal", led by Sâr Joséphin Péladan, which led to compositions such as Salut drapeau!, Le Fils des étoiles, and the Sonneries de la Rose+Croix. Satie gave performances at the Salon de la Rose + Croix, organized by Péladan. Satie and Suzanne Valadon (an artists' model, artist, long-time friend of Miguel Utrillo, and mother of Maurice Utrillo) began an affair early in 1893. After their first night together, he proposed marriage. The two did not marry, but Valadon moved to a room next to Satie's at the Rue Cortot. Satie became obsessed with her, calling her his Biqui and writing impassioned notes about "her whole being, lovely eyes, gentle hands, and tiny feet". During their relationship, Satie composed the Danses gothiques as a means of calming his mind, and Valadon painted a portrait of Satie, which she gave to him. After six months she moved away, leaving Satie broken-hearted. Afterwards, he said that he was left with "nothing but an icy loneliness that fills the head with emptiness and the heart with sadness". It is believed this was the only intimate relationship Satie ever had. Satie's last compositions were two 1924 ballets. Mercure reunited him with Picasso and Massine for a mythological spoof produced by Count Étienne de Beaumont's Soirées de Paris, and he wrote the "instantaneist" ballet Relâche in collaboration with Picabia, for the Ballets suédois of Rolf de Maré. In a simultaneous project, Satie added music to the surrealist film Entr'acte by René Clair, which was given as an intermezzo for Relâche. After years of heavy drinking (including consumption of absinthe), Satie died at age 59, on 1 July 1925 from cirrhosis of the liver. He is buried in the cemetery in Arcueil. There is a tiny stone monument designating a grassy area in front of an apartment building – 'Parc Erik Satie'. Over the course of his 27 years in residence at Arcueil, where Satie lived in stark simplicity, no one had ever visited his room. After his death, Satie's friends discovered an apartment replete with squalor and chaos. Among many other unsorted papers and miscellaneous items, it contained a large number of umbrellas, and two grand pianos placed one on top of the other, the upper instrument used as storage for letters and parcels. They discovered compositions that were either thought to have been lost or totally unknown. The score to Jack in the Box was thought, by Satie, to have been left on a bus years before. These were found behind the piano, in the pockets of his velvet suits, and in other odd places, and included Vexations; Geneviève de Brabant and other unpublished or unfinished stage works; The Dreamy Fish; many Schola Cantorum exercises; a previously unseen set of "canine" piano pieces; and several other works for piano, many untitled. Some of these would be published later as additional Gnossiennes, Pièces froides, Enfantines, and furniture music. ^ English approximation of the surname: UK: /ˈsæti, ˈsɑːti/, US: /sæˈtiː, sɑːˈtiː/ ( Wells, John C. (2008), Longman Pronunciation Dictionary (3rd ed. ), Longman, ISBN 9781405881180 ). ^ Christopher Innes, Maria Shevtsova, The Cambridge Introduction to Theatre Directing (Cambridge and New York: Cambridge University Press, 2013), p. 151. ^ "Documents of Dada and Surrealism: Dada and Surrealist Journals in the Mary Reynolds Collection". Artic.edu. Archived from the original on 12 February 2015. Retrieved 1 August 2017. ^ Robert Orledge, Satie the Composer (Cambridge and New York: Cambridge University Press, 1990): p. xxxviii. ^ Steven Moore Whiting, Satie the Bohemian: From Cabaret to Concert Hall (Oxford: Clarendon Press; New York: Oxford University Press, 1999): p. 105. ^ in: Mary E. Davis: Erik Satie. Reaktion Books – Critical Lives. (Published[full citation needed], 2007): p. 25. ISBN 978-1-86189-321-5. ^ Caroline Potter, Erik Satie: A Parisian Composer and His World ([full citation needed]Boydell & Brewer, 2016): p. 1. ^ Mary E. Davis, Erik Satie ([full citation needed]: Reaktion Books, 2007): p. 21. ^ Mary E. Davis, Erik Satie ([full citation needed]: Reaktion Books, 2007): p. 31. ^ Steven Moore Whiting, Satie the Bohemian: From Cabaret to Concert Hall (Oxford: Clarendon Press; New York: Oxford University Press, 1999): p. 151. ^ Steven Moore Whiting, Satie the Bohemian: From Cabaret to Concert Hall (Oxford: Clarendon Press; New York: Oxford University Press), 1999): p. 156. ^ DesLettres (20 June 2016). "Lettre d'Erik Satie à Suzanne Valadon : " Partout je ne vois que tes yeux. " - Des Lettres". Deslettres.fr. Retrieved 1 August 2017. ^ Jane F. Fulcher, French Cultural Politics & Music: From the Dreyfus Affair to the First World War, Oxford and New York: Oxford University Press, 1999, p. 199. ^ John Williamson, Words and Music (Liverpool: Liverpool University Press, 2005), p. 161. ^ Robert Orledge, Satie the Composer (Cambridge and New York: Cambridge University Press, 1990): p. 235. ^ Melissa Lesnie, "Five Things You Didn't Know about Erik Satie", Limelight (13 June 2012). Retrieved 22 October 2014.